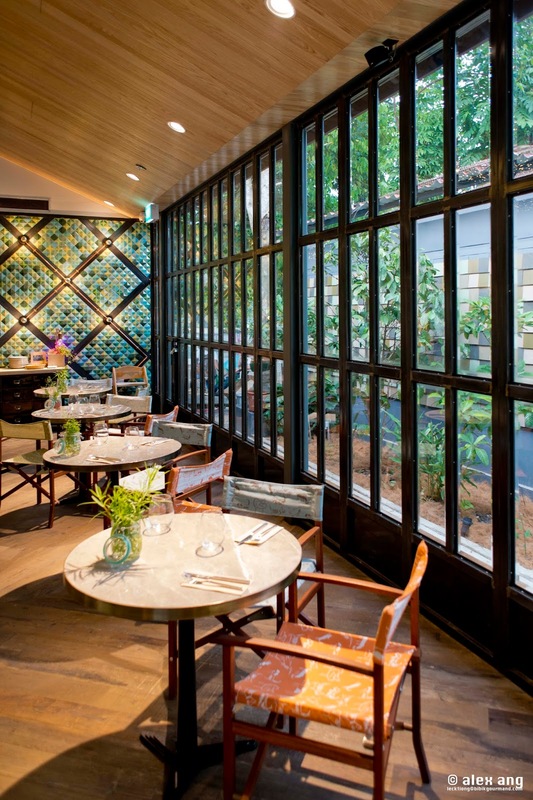 With the concrete jungle that is Singapore, strolling in a farm is hardly something a Singaporean can attest to doing often, let alone actually dining in one. But the July debut of Open Farm Community (“OFC”) gives us reasons to be optimistic. A tripartite collaboration between Ryan Clift of Tippling Club, Cynthia Chua of Spa Esprit Group and Edible Garden City, OFC rests on a sprawling 35,000 square feet plot in Minden Road, a relatively quiet stretch in Dempsey Village. The urban farmland, which is a stone’s throw from the Singapore Botanic Gardens and 5 minutes by car from Orchard Road, boasts about 100 types of edible crops including a plethora of herbs – such as cat whiskers, five types of basil, sage, thyme and mint – and an array of vegetables like eggplant, lady’s finger and cherry tomatoes. The raison d’être of the farm is the restaurant, which is set in a glass and steel building in the mist of the lush property. Opened to a packed house since July, the 70-seat eatery looks the part of a farmhouse with its generous use of recycled materials ranging from the planks of recycled gate grill lamps that light up the room like stars in the evening, to the recycled wood flooring that gives the place a trendy but rustic feel. Tucked at the far end of the room, a bright and cheery semi-open kitchen – with a stainless steel-clad Paolo Parisi custom-built coal oven– holds court. Flanking the pretty kitchen frame are chefs fast at work. You will not see Ryan Clift doing his culinary swagger in the kitchen, plating the dishes or cutting the herbs in the garden. His Open Door Policy (ODP”) henchman, Daniel Sperindio, an Italian native, splits his time between ODP and here. The cuisine here is neither avant garde nor Italian. To call it farm-to-table will also be a stretch (at the moment, only 60% of all herbs and 20% of the vegetables used are harvested on site). “Fresh”, “casual” and “family style” are better catchall phrase to describe OFC’s approach, which is underscored by a cuisine style that leans towards Asian-inflected modern European. 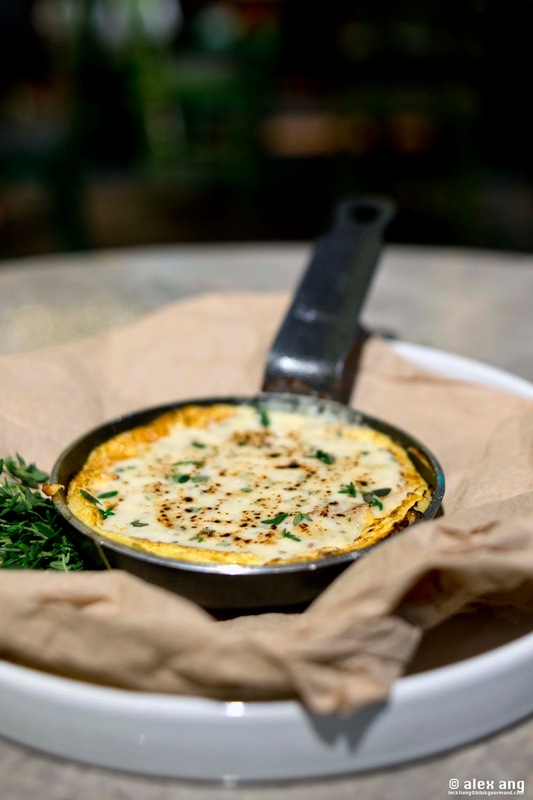 During our visit on a packed weekday night, we were awed by a seemingly simple dish of coal-baked omelette (S$24) that could have passed for brunch. We had it for dinner, topped with sliced smoked French haddock and enriched with a coat of mornay sauce. Moist in the middle and just a tad crisp on the edges, the omelette was devastatingly simple but simply irresistible. The dish of chilled avocado and ginger broth with poached yabby (S$20) wouldn’t have looked out of place in a spa café. 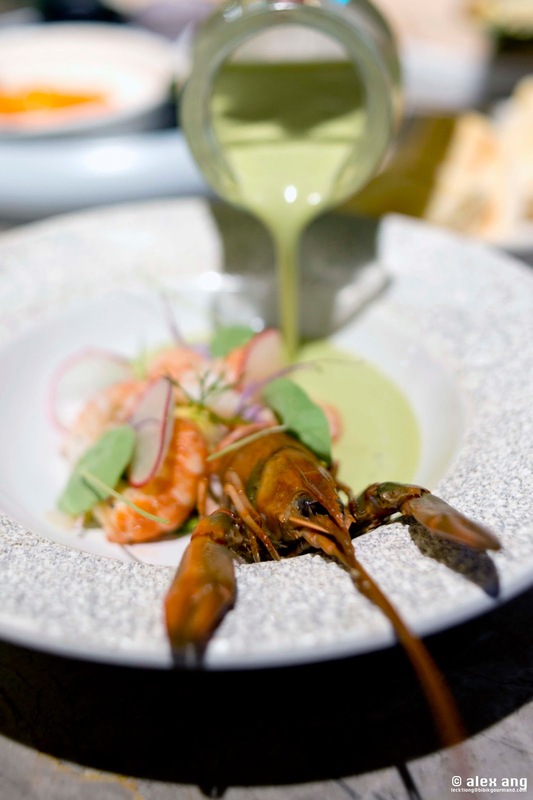 To give the soup the fragrance of Thai tom kha, avocado puree and coconut milk were blended with mixed herbs including galangal and coriander, and then served tableside over a plate of poached yabby decorated with bits of chervil and nasturtium. The Malaysia-farmed yabby was surprisingly plump and the broth aromatically refreshing although it started to cloy towards the last few sips. We reckon you should share it before “diminishing returns” hit. The fermented carrot tartare (S$24) sounded promising on paper. 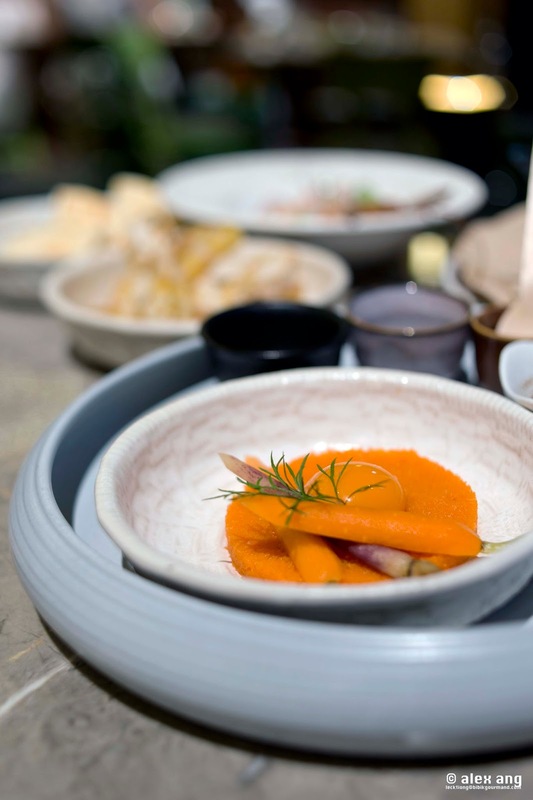 Baby carrots were bran-fermented on a nuka pickling bed and served on ground carrot topped with a disc of free-range organic egg yolk. Served steak tartare-style alongside do-it-yourself sides of pickles, chives, capers, gherkins and gochujang (Korean fermented chili paste), the mash-up was tart, sweet and spicy. Interesting? Yes. But not necessarily delicious – carnivores need not apply. If the starters were great, the house made pastas were better (well, mostly). 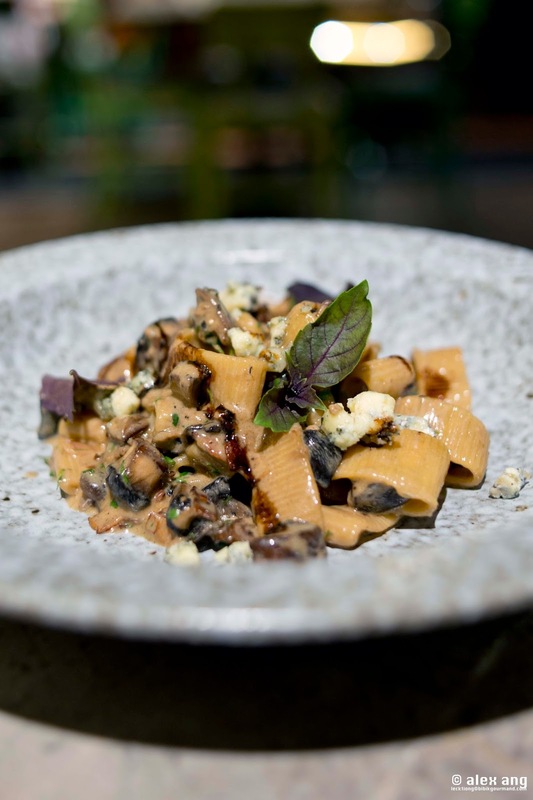 Of the three types of pastas we sampled, pan tossed rigatoni with porcini and local mushrooms (button and shimeji) stood out with an intensely profound umami flavour amplified by the addition of smoked pancetta and Stilton blue cheese. It was first class. Trailing behind quite closely was squid ink tagliatelle, each strand richly coated in a tear jerking tomato-based “inferno sauce” spiked with chilli padi. 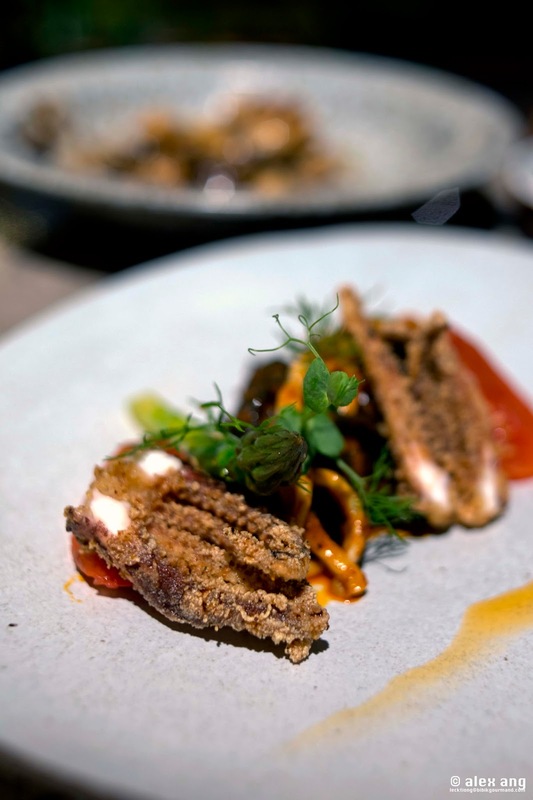 It arrived with calamari, its deep-fried tentacles and short spears of asparagus, which provided distractions but offered no reprieve from the heat. 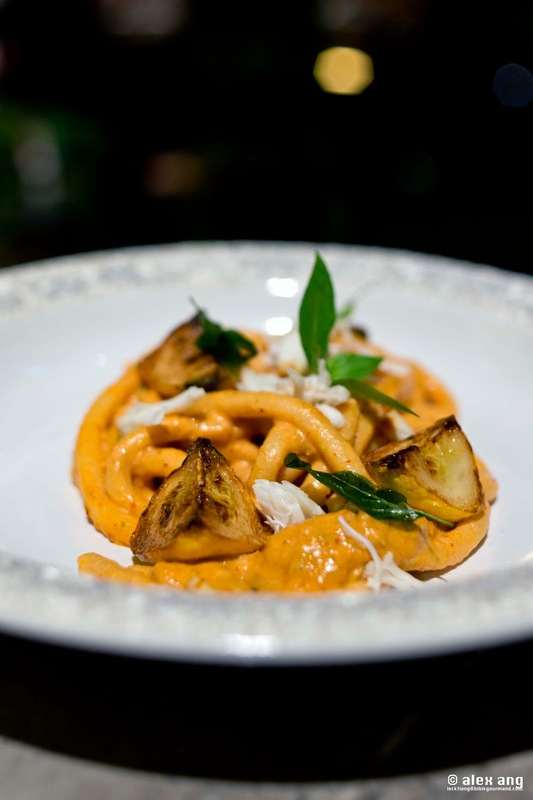 Unless you’re a fan of creamy pastas, we don’t suggest you venture down the path of mud crab spaghettoni. Notwithstanding the lovely shreds of poached Indonesian mud crab, the Thai-inspired curry sauce was choking with coconut cream. And apart from delicious wedges of yellow squash, there was nothing in sight to cut the richness. 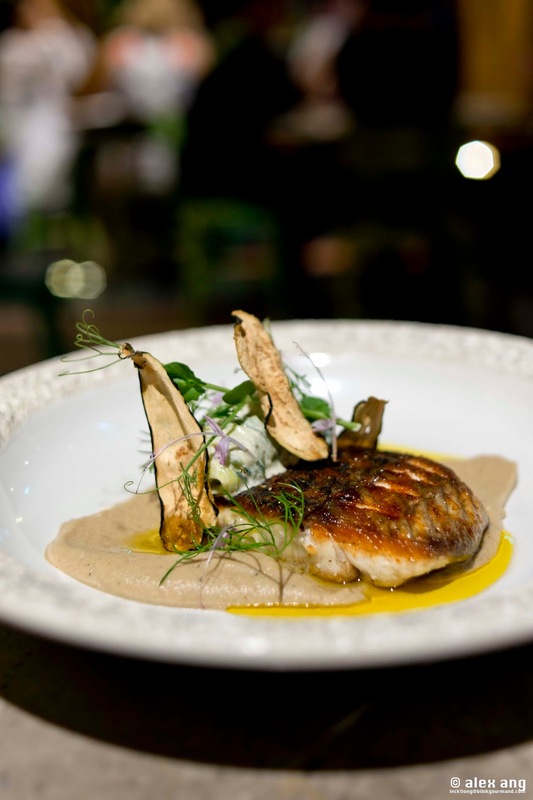 For mains, there was a chunky piece of Malaysian-farmed barramundi. It was pan seared until the skin turned a crispy, golden-brown while its white flesh remained nonchalantly moist. Like a work of art, it arrived on a plate with a smooth spread of baba ganoush (a Levantine dish of roasted-mashed eggplant mixed with onions and yoghurt) perfumed with curry. A side of shredded cucumber salad with yoghurt and mint added to its overall Indian-esque appeal. It was pretty decent. We were less intrigued with the chicken. Pan-seared chicken breast and its leg confit were served coiffed up high with braised leek in a crushing avalanche of hazelnuts glazed in burnt butter chicken jus. There was no doubt the mound looked visually stunning but, taste-wise, it failed to match up. If we may venture a guess, the earthiness of the hazelnut stole the thunder from the chicken jus, yielding a flavour that was less than savoury. OFC offers honest-to-goodness food with a strong urban farm concept and mostly unpretentious cooking that steers clear of modishness. Even if our dinner wasn’t all milk and honey, you could have a mighty good meal if you know exactly where to look.